Happy back to school to all parents and children! Not all kids appreciate going back to school, but I'm sure their parents do! People are people whether they're 8 or 18 or 80! Learning to appreciate the learning process is always helpful, just like being flexible about change in our lives, especially since there seems to be so much change these days. And . . . speaking of learning and change, this month I've had a new challenge trying to learn to use a MAC product and not a PC. My husband and I purchased an iPad so that I can keep up with my website better during the week. So far, I like it a lot although, just like anything else, it has it's pluses and minuses. The biggest minus for me is that it doesn't interface with my PC without going through ITunes and downloading some additional applications(which is a drag). Also, I can't store items directly on the iPad itself. However, there were work around applications and they were fairly easy to find. More importantly, they were FREE!! Overall, I find the iPad an awesome device. If you decide to get one, I would recommend getting one with 3G capability. The first one I tried didn't have it and I wasn't able to use it in certain locations. Thanks to Best Buy's good customer service and return policy, we were able to exchange it for the 3G version. I don't like that it was about $130 more, but it seems to be well worth it because I wrote this newsletter on my iPad!! The iPad is also giving me new experiences to write about. For example: How to stay organized using Apple Apps. Don't forget to check out the pages and articles (links in this newsletter) for back-to-school. Make it a great year and have a blessed day! Thank you for your continued interest in Messy Makeover Magazine. Many kids went to college for the first time this year. For many, this is the first time they've been on their own without parental supervision for an extended length of time. This can be a challenge for both parents and the kids! The tips provided here should make that tiny dorm room feel larger. Since most kids are sharing a room, use what tips make the most sense for your individual situation. TIP #1 USE WHAT YOU HAVE Most likely, you packaged your stuff in boxes, bags or covered storage bins with lids. After removing the contents, these can be useful to store the items that you are not going to use immediately, such as off-season clothing, etc. It especially helpful if you used clear storage bins with lids. If not, make a note to use these next year instead of cardboard boxes. TIP #2 KEEP THE CLUTTER TO A MINIMUM If you're a messy, it's time to change your ways! The smaller the space, the more necessary it is to keep it uncluttered and organized. If you're the "neat nick" and your roommate is the "messy," have a talk with him/her and try to come to terms. If you don't get cooperation, see if you can switch rooms and/or roommates. 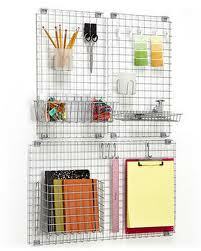 TIP #3 UTILIZE ALL THE SPACE YOU HAVE Don't forget to utilize every inch of space in your room. 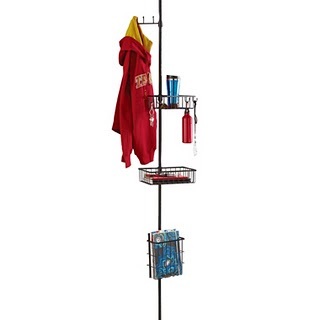 Investing in over-the-door shoe racks, add shelving (if allowed), use Command hooks on the walls to hang your hats, etc. Beware storing valuables in easy to reach locations. Utilize the space under your bed for shoes, off-season clothing, etc. TIP #4 FURNITURE -- PROPER SIZE & MULTI-FUNCTIONAL Most rooms come with a bed, some have a desk. If you must purchase a desk, check the layout of your room. Corner desks can take up less space than a rectangular desk. See if the desk has a credenza that fits on top for additional storage. Chairs come in many shapes/sizes. You can find some that have storage under the seat. Try to make sure all furniture items are smaller scale to fit the room properly, have storage (if possible) and makes good use of vertical space since horizontal space is usually limited. TIP #5 COMPUTERS Although laptops take up less space than a desktop computer, laptops are easy to steal and, unfortunately, theft is a part of life. If you have a laptop, be sure to store it and keep it under lock and key. I love the portability of my iPad, but it has the same problem. Think security if using smaller electronic devices. TIP #6 KEEP IT LIGHT Allow as much light (natural light as well as lamps). A light room makes the space feel larger. If you have windows, keep the blinds open during the day. Floor lamps and task lighting over desks and work space will help keep your room feeling welcoming. I hope you enjoyed the September 2010 issue of Messy Makeover Magazine. I consider it a privilege that you took your valuable time to subscribe and read this magazine. Return to top of September 2010 Issue Hi, this is Shelly Morton..the author of this newsletter. I know you hear a lot about how to build an online business, but nothing compares to what you will see when you click the box below. Simply the best way to break the 9-5 routine!